I'm always so excited to try a brand that's new to me, especially when I've heard a lot about them before! That brand today is Illamasqua! Illamasqua is a U.K. based brand who's motto is "You are Beauty" - they are all about embracing diversity and imperfections. The brand focuses on individuality and personal expression through makeup. Illamasqua is cruelty free, vegan and Peta certified! 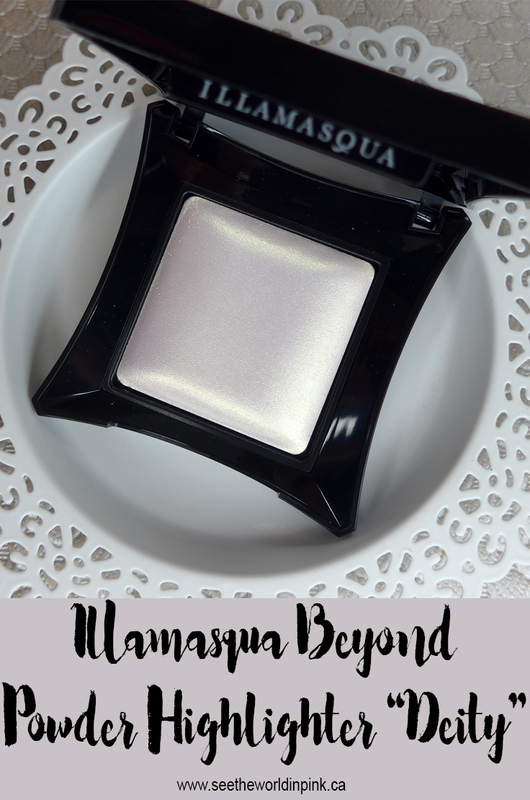 Illamasqua Beyond Powder Highlighter in "Deity" ~ £34.00/ $57.80 CAN. The ultra-lightweight baked powder seamlessly glides across skin with a silky soft finish, delivering intense colour pay off with an iridescent glow for an almost holographic result that evokes the fresh, blooming radiance of a dewy, spring-time morning. The shade Deity is described as a unique golden-green hue to give your skin a subtle luminosity. This is a truly beautiful highlighter - it's difficult to catch the beautiful shift from white to pink to gold to greenish on camera! It's stunning! This comes in a really nice, solid compact with a mirror in it - it is a large pan; but, I do think it is on the expensive side for a highlighter! I personally received this in my Lookfantastic Advent Calendar, so I didn't pay full price for it. But, regardless, I am very excited to have received this brand and gotten a chance to try this!!! This highlighter is a super unique shade - it looks much more white and pink in the pan; but, really does come off as a light green gold! I don't have anything like this in my collection! The formula itself is on the powdery side and it applies really nicely. It's shimmery and blends out well. It gives a gorgeous glow to the skin and looks really great! Here is a look with the Illamasqua Beyond Powder Highlighter in Deity on the cheeks! I've paired it with the Note Cosmetics Luminous Silk Compact Blusher in Desert Rose, the ColourPop Disney Designer Ariel Lipstick, the Viseart Golden Hour palette, and the Covergirl Exhibitionist Mascara. Have you tried anything from Illamasqua before? Would love to hear your recommendations about what I should try from the brand!